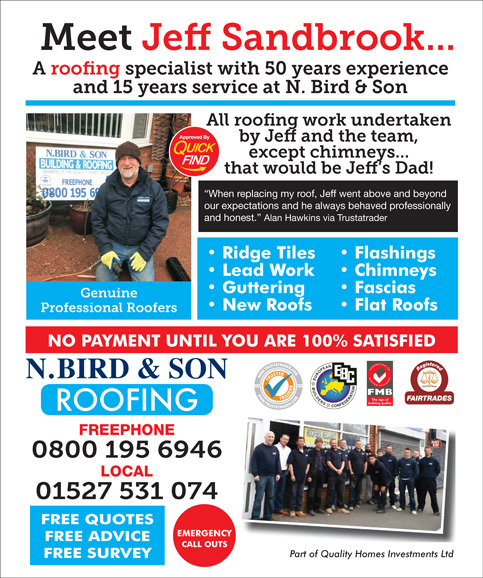 Approved and recommended by Quick Find Directories, N Bird and Son Roofing are a family run business established in 1991. They provide the full range of roofing services to domestic, commercial and industrial clients. A local trusted roofer in Birmingham, Castle Bromwich, Halesowen, Olton, Quinton, Redditch, Rubery, Shirley, Solihull, Streetly, Tamworth and surrounding areas. If you're not sure whether they cover you area then just give them a call and they will be delighted to help. "Had roof work done would highly recommend, very friendly & helpful." "Fantastic company. Reliable, efficient, polite and tidy. They did my roof last year after others had failed to fix the problem. Still watertight!" "Absolutely excellent company, paid nothing up front and the work was to a very high standard."